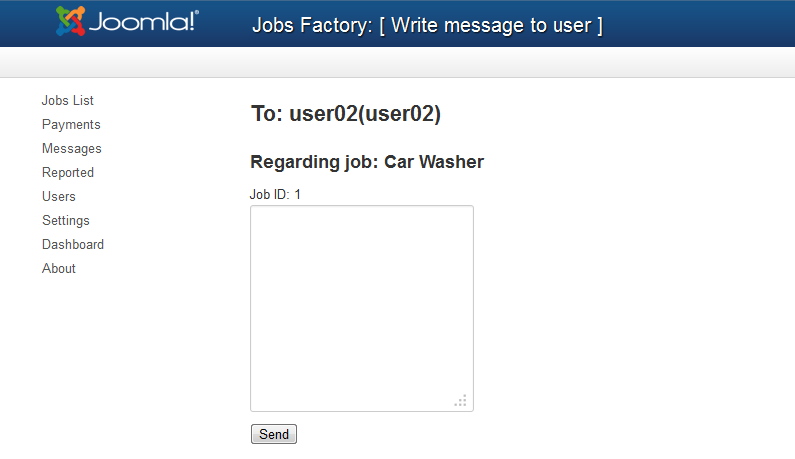 To manage the job offers on your website you can go to the Jobs List page in the backend. The jobs are displayed in a list containing basic information related to them. Multiple quick jobs management and sorting features are present here, like the status of the job offer, toggling it to Published/Unpublished, Running/Closed and also the option to Block/Unblock certain offers. In the columns found here, you can also verify how many visits your offer had, the expiration date and how many candidates have applied. There is also a filter manager that allows you to filter jobs when browsing. You can enter a keyword and/or a username, browse by status along with sorting by each column. On the details page, you can view all the fields displayed on the frontend, allowing you to edit them, if needed. On the right side, you have more job-related details, like employer details and admin messages, all in a compact tabbed format. The Reported page allows you to verify all the reports that have been made by the users and take the appropriate measures. A job can be reported as abusive by clicking on the red flag found at the top of the job's page and then typing the reason. Here you can see the name of the user who made the report, when he did it and the reason for it. When the case is solved, select the checkbox and click on Mark as solved. By clicking on the reported job will redirect you to the edit page of the respective job offer, allowing you to change, if needed, the inappropriate things about it. Write message will allow you to contact the company who made the job offer by sending messages regarding the reason of report.